Curly and I just finished a new book. I’ve seen it listed on many booklists but had never read it. I found a used copy and we started right in. I have to admit that it was hard to get into the first few chapters. I wasn’t too impressed. But as we got past the third chapter, we started to really enjoy this book. Some boys are out exploring and they find a poor owlet who fell from his nest in a storm. One boy decides to take the owl home, naming him WOL after Owl from Winnie the Pooh. The owl joins the other odd pets in the family, including a bunch of gophers. Wol quickly becomes attached to the boy and views himself as an “inside” owl. Not long after Wol joins the family, the boy rescues another small owlet. 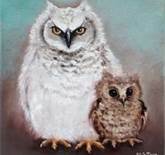 This new addition he names Weeps and Wol soon sees himself as Weeps’ caretaker and protector. Wol is a friend to everyone except the neighborhood cats and dogs that he terrorizes and Weeps is the sad little owl who never believes he can fly. After the two owls, join the family, their life is never the same. We laughed out loud at the antics of the two owls and the poor boy who cares for them. Curly loved reading about the boys’ adventures and was so sad when the story ended. Although there are a few parts of the story that are dated and not exactly politically correct-like the bullying, some other boys using an owl family as target practice, and keeping owls as pets, the story was warm and funny and sweet. The little boy’s heart was as big as his backyard zoo. I’m saving this book for Tiger! We loved this book! After we read it I was wishing I had done an entire Owl unit study, but I am not organized enough to think ahead like that apprently. Every now and then I am on the ball – but those moments are few and far between!